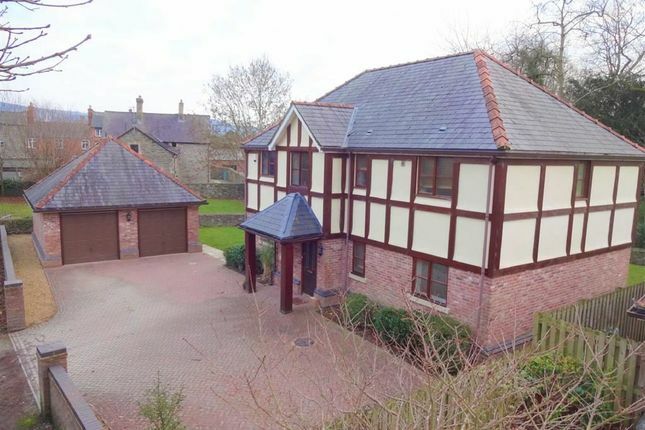 Modern Detached Four Bedroomed House. Situated in a quiet location, but within easy walking distance of the town centre. On the edge of Powis Castle Parkland and within a few minutes walk of its renowned gardens. Having been built 10 years ago to a high specification. The property has gas fired heating via a 'Worcester' boiler, wood framed double glazing throughout, integral kitchen appliances and high quality bathroom and shower fittings. There are two separate sitting rooms, spacious kitchen/dining area, four bedrooms (2 En-suite) and a family bathroom. With balustraded staircase off and storage cupboard under. Oak flooring. Radiator. Built-in linen cupboard housing hot water cylinder. Fitted base units under granite worktops incorporating single drainer sink with mixer taps over. Plumbing in point. Ceramic tiled flooring. Radiator and extractor fan. Ceiling spotlights. Wall mounted 'Worcester' gas boiler. Side access door. Glazed frontage with French doors opening into garden. Oak flooring. 2 radiators. Telephone and TV points. Built-in double wardrobe. Radiator. French doors opening into rear garden. Comprising low level w.c and pedestal wash basin with mixer tap. Separate shower cubicle with direct feed shower. Ceiling downlighting. Chrome heated towel rail. Extractor fan and electric shaver point. Ceramic tile floor. Radiator. French doors into rear garden. With tiled bath and mixer, low level w.c and pedestal wash basin. Ceiling downlighting. Ceramic tile floor. Heated towel rail. Extractor fan. Balustraded staircase to First Floor Landing with central heating thermostat control. With pedestal wash basin. Tiled walls and flooring. Radiator. Fitted modern wall and base units under granite worktops incorporating 1½ bowl sink with mixer tap. Integrated 'Zanussi' double oven with 5 ring hob and extractor over. Built-in fridge/freezer and dishwasher. Ceiling down lighting. Tiled flooring. Radiator. French doors opening onto balcony. Telephone and TV points. Glazed fronted room with French doors opening onto balcony. 2 radiators. Telephone and TV points. French doors onto balcony. Built-in double wardrobes. Radiator. Access to loft. Telephone and TV points. Fitted low level w.c, pedestal wash basin and bath with mixer taps. Separate shower cubicle with direct feed shower. Ceiling downlighters Chrome heated towel rail. Extractor fan and electric shaver points. Ceramic tile floor. Brick pavior frontage suitable for parking several vehicles. With twin up and over doors and separate side access. Electricity connected. Lawn to side and rear bordered by a low level stone wall. Is off the council highway via Park Lane and a shared private access. Mains services connected including gas. None of the services, appliances, central heating system, chimneys, flues and fireplaces have been checked and no warranty is given by the Agents. Council Tax Band 'G' (Powys County Council). 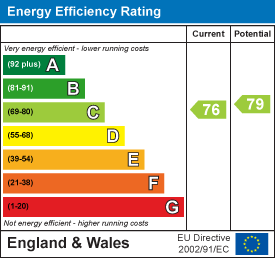 A full EPC is available on request or by following the link below. From the Office, turn left proceeding up Broad Street into High Street, Turn left opposite Rikki Lloyd's butchers into Park Lane and proceed to the park gates, The property will be found on the left indicated by the Agents 'For Sale' sign. To view a complete listing of properties available For Sale or To Let please view our website: Our site enables you to print full sales/rental particulars, book viewings, register your requirements on our mailing list and arrange a valuation of your property.